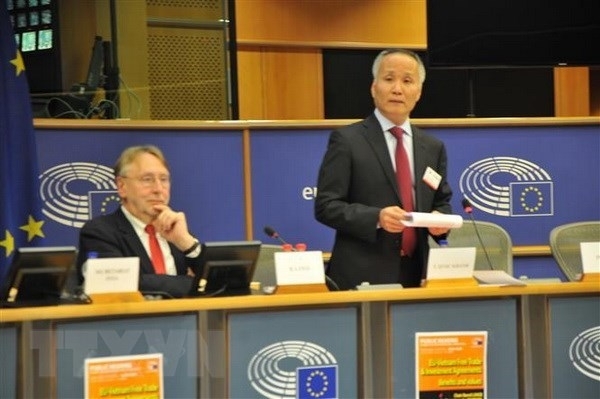 The European Parliament (EP)'s Committee on International Trade (INTA) on October 10 held an opening hearing on the Free Trade Agreement (FTA) and the Investment Protection Agreement (IPA) between Vietnam and the European Union (EU). Addressing the event, Head of the Vietnamese delegation to the hearing Deputy Minister of Industry and Trade Tran Quoc Khanh said Vietnam is integrating into the world as it has joined many international conventions and has trade partnerships with many countries. Amid increasing protectionism, Vietnam firmly supports multilateral relations based on consistent principles, he stressed. While confirming Vietnam and the EU are big partners, Khanh said the EU has supported Vietnam in promoting development and reducing poverty, and that the two sides are moving towards a more comprehensive relationship. He noted the benefits brought by the agreements, from boosting trade exchange and fostering investment of European countries into various spheres, to helping Vietnam improve its standards to conform with international ones. Helena König, Chief Negotiator and Deputy Director General for European Trade highlighted the importance of FTA and IPA between the EU and Vietnam, and affirmed Vietnam's attractiveness, with its growing economic strength and a market of 95 million people. As Vietnam has signed many FTAs with partners across the world, König said the EU-Vietnam FTA (EVFTA) will help European businesses enhance competitiveness in Vietnam. The IPA will help protect European investors doing business in Vietnam, she said, adding Vietnam's commitments will better protect labourers' rights, protect the environment and promote sustainable development. At the event, many speakers mentioned the benefits brought by the agreements and expected Vietnam's ratification of a new Labour Law in 2019 will serve as a legal basis for the ratification of the three fundamental conventions of the International Labour Organization (ILO) in the future, contributing to enhancing global integration capacity. They said EVFTA is a good opportunity to expand EU-Vietnam cooperation in forest and environment protection, as well as increase export opportunities for green products. In an interview with a Vietnam News Agency correspondent, Chairman of the European Chamber of Commerce (EuroCham) Nicolas Audier said the hearing was satisfactory as the two sides delivered clear messages. He noted Vietnam has made spectacular progress in many fields, especially socio-economic development over the last 30 years. Under the roadmap, the EC will send a dossier to the European Council to ask for authorisation to sign the EVFTA. After signing, the agreement will be submitted to the European Parliament (EP) for approval. The EP can adopt the agreement ahead of the new European parliamentary elections scheduled for May 2019.